Blackchalk’s café offers salads and light fare to re- energize after antiquing. Driving along US 290 west to Fredericksburg from Johnson City, I’m struck by how much the roadside scenery has changed in two decades. For information about Fredericksburg’s many options for wine, food, shopping, lodging, and activities, call the Fredericksburg Convention and Visitor Bureau, 830-997-6523 or 888-997-3600. The Visitor Information Center is at 302 East Austin Street. In my mind’s eye, I can see those primitive stands selling local peaches, weathered signs promoting the upcoming county fair, and an occasional old farmhouse amidst vistas of wildflowers. Back then, Fredericksburg’s renown rested on its beauty, B&Bs, German heritage, and shopping on Main Street. Today, there’s all that and more: Vineyards, winery tasting rooms, boutiques, restaurants, and shops have brought new energy to Fredericksburg. I think how much our early girlfriend getaways would have benefited from such luxuries; I clearly remember an old roomie of mine pining for a mocha latte and a spa day when we were here about 20 years ago, and I wish she could see today’s Fredericksburg. Just as I enter the city limits, I note the beautiful Hill Country University Center, where Texas Tech University offers viticulture and winemaking education. Soon I’m marveling at the proliferation of new and old buildings housing bistros, coffee bars, art galleries, and herb apothecaries. I spy the occasional shop offering T-shirts, fudge, and German beer steins, but altogether I find a more sophisticated Fredericksburg. What really matters, though, is this: While the town is most famous for its rich German heritage, it has grown into an invigorating destination for all of the pleasures found in the heart of the Hill Country, whether I’m visiting with my mom and sisters, closest pals, or my husband. Fredericksburg, the seat of Gillespie County, lies at the center of the Hill Country wine region, which is a significant driver in the exploding Texas wine industry. 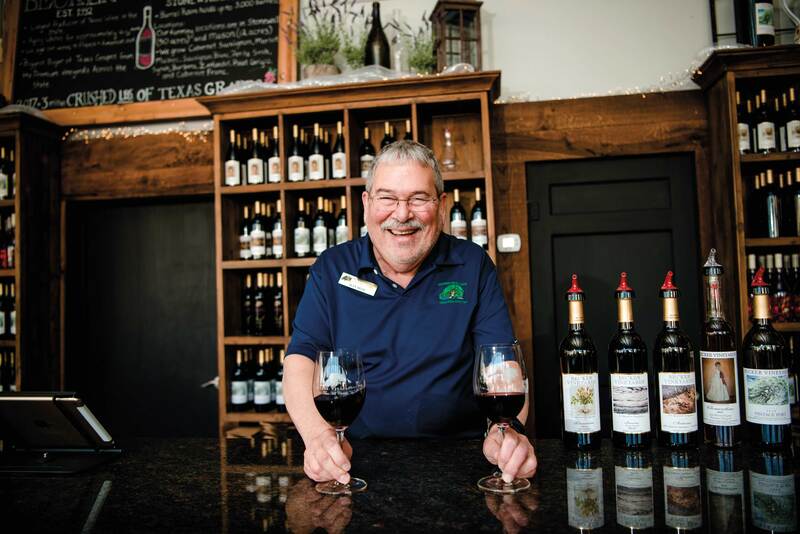 Just a short drive from downtown Fredericksburg, wine tourists find more than 50 wineries and vineyards, and in Gillespie County alone, the count is nearly 30 wineries. Nearly all of them offer tasting rooms, and about 10 have satellite tasting rooms downtown. On Main Street, my husband and I wander into the newest addition to the so-called “Urban Wine Trail,” Becker Vineyards’ tasting room in a smartly renovated former Buick dealership showroom. The eye-catching design elements, particularly the repurposed parts, accessories, and service signage in a curved retro style, make the space distinctive. Fredericksburg, the seat of Gillespie County, lies at the center of the Hill Country wine region, which is a significant driver in the exploding Texas wine industry. Becker has been making wine at its winery southeast of Fredericksburg since the mid-1990s, and with the opening of a Main Street tasting room, it’s easier than ever for fans to explore its many styles. As is the case at almost every tasting room in the world, guests have the option to try a flight of small pours. At Becker, a lovely piece of Riedel crystal stemware is included in the tasting fee ($20 for six wines) as a souvenir. Instead of bellying up to the long tasting bar, we sit at a vintage wooden community table to savor a full glass. I’ve chosen the 2014 Raven, a robust, spicy-fruity blend of petit verdot and malbec grapes that recently claimed a double gold medal at the San Francisco Chronicle Wine Competition; my husband enjoys his pick, the 2015 Prairie Cuvée, a Rhone-style white blend that won a silver medal at the same competition. While we sip, I check out the retail area, an assemblage of old wooden crates and barrels filled with must-haves such as chic wine coolers and products made with lavender grown on the Becker estate. Tasting room ambassador Alan Dean serves up smiles and wine at Becker Vineyards. Main Street still buzzes with beer lovers, and Fredericksburg Brewing Company, which opened in 1994, has never been more popular. The brew house, restaurant, and retail shop fill the ground level of a restored 1890s limestone building, and there’s a B&B upstairs. The beer menu changes regularly, so you can try something new on each visit, whether it’s the popular Honey Cream Ale, made with local honey; or the hoppy, British-style Harper Valley IPA. Fredericksburg’s status as a beer town will soar to new heights later this year, when Altstadt Brewery opens its 120-acre Bavarian village showplace with a beer garden and restaurant. The copper roof over Altstadt’s main brewery and its giant silos are already eye-catching sights on US 290 just east of town. The three beers brewed here include the malty, caramel-colored alt; a light, clean-tasting lager; and the crisp, hoppy kolsch. All are already popular picks throughout the Hill Country and in Austin, San Antonio, Waco, and College Station. It’s an easy shot from Altstadt to the hamlet of Hye, home to Garrison Brothers Distillery, where bourbon is handmade in small batches and hand-bottled right on the ranch. After a hay-wagon ride to see the bourbon-making process, we sample a selection of heady barrel-aged creations in the log cabin that serves as tasting room and welcome center. Although the distillery and breweries make solid alternatives to wine touring, make no mistake—wine-wandering rules as the favorite Fredericksburg pastime. On weekends, it’s a good idea to sign up with an organized tour or check whether specific wineries require reservations. (There are nearly 20 Fredericksburg-based wine touring companies providing guides and transportation.) Knowing that crowds can be daunting, we heed wise locals’ advice and keep our touring to a weekday. At Grape Creek Vineyards, a 15-minute drive from the center of town, the motto is “wine is a pleasure, not a party.” On Saturdays, when crowds surge throughout the area, Grape Creek limits tour groups and excludes limo tours entirely. Pulling onto the property, we climb a hill that ultimately reveals a spread of vineyards and an assemblage of stone buildings evoking the look and feel of Tuscany. We join guests aboard a tram that takes us across the estate to the winemaking facilities, where we barrel-sample wines in various stages of the aging process. Next, we walk through the crushing and fermenting areas before tasting six wines from a list of nearly 20 choices, including the spicy petite syrah, which is my favorite. Our guide, a symphony conductor who moonlights at Grape Creek, offers such an informative, entertaining commentary that many guests buy bottles to take home. A distinctive wine-tasting experience appeals to us at Kuhlman Cellars in Stonewall, roughly 20 minutes east of downtown Fredericksburg. Flower and herb gardens surround a pair of gray-and-white contemporary buildings, one with a rooftop patio. We’ve arranged to experience Kuhlman’s “Signature Pairing,” a guided wine-and-food pairing. Our sommelier educates the eight of us through tastes of five Kuhlman wines, each coupled with a two-bite appetizer. Chef Chris Cook changes the pairings according to the season; ours included the combo of 2016 Hensell, a salmon-hued, French-style rosé made with mourvèdre grapes grown in the Texas High Plains, matched with a tiny taco filled with black beans and spicy chicken. After the tasting, everyone’s welcome to enjoy another glass on the patio or in the airy tasting room, where natural light spills through windows overlooking the 7-acre property. Though a few of the older German restaurants remain in Fredericksburg, my favorite dining experience in town may be the modern interpretation of that cuisine at Otto’s German Bistro. Otto’s sits in the middle of town in a simple white cottage near the town’s visitor center and across the street from the exceptional National Museum of the Pacific War. Sipping a cocktail called the Jürgen—made with rye, a fruity vermouth, toasted barley liqueur, and walnut bitters—I study the quirky knickknacks on a shelf above the bar, including a 1950s clock radio, a vintage french fry slicer, and a small Electrolux vacuum cleaner. Our dinner starts with rustic German bread, butter, and beet jam then continues with duck schnitzel over spätzle, as well as gnocchi stuffed with ricotta and sage and tossed with roasted butternut squash and leafy greens. 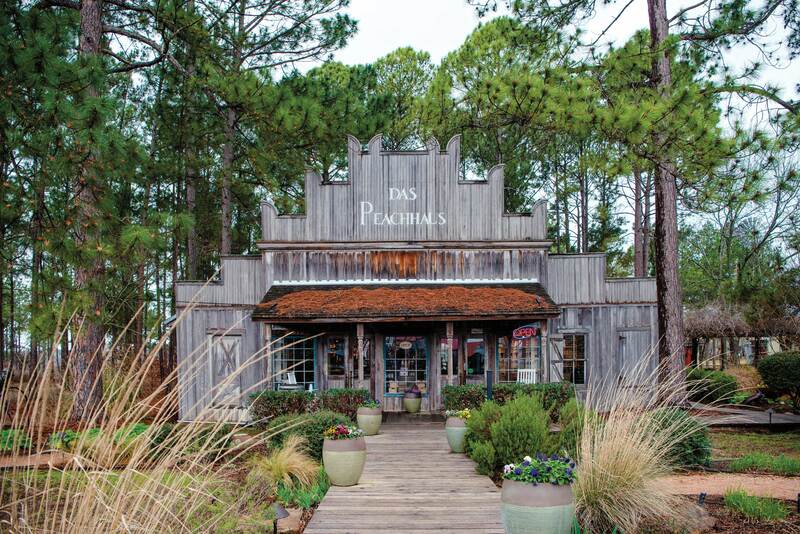 Das Peach Haus offers tastes of dozens of salsas and jams. Another evening, we perch on stools at the Culinary Adventure Cooking School, inside Fischer & Wieser’s Das Peach Haus, for a cooking class with John DeMers. DeMers is a chef, instructor, and the author of several cookbooks, and it’s great fun to share an evening of wine tasting with food pairings. On this night, DeMers serves up his usual amusing discourse alongside delicious and finely crafted dishes of serrano ham and Manchego cheese appetizers, meatball-artichoke soup, poached cod, and beef tenderloin, all accompanied by delicious wines. Fine oil paintings and bronze sculptures figure among Fredericksburg’s souvenirs today, though you can still find beer steins and spangled jewelry. The handsome Schwarz Building on Main Street, a 1900-era rock structure that once held a dry goods store, now houses the elegant InSight Gallery, displaying beautiful landscapes, wildlife-focused works, and Western-themed pieces. But my favorite galleries and shops take me off Main Street, southward along Lincoln Street. Out front at a shop called Blackchalk Home and Laundry, a heavy-duty commercial laundry press speaks to the century-old building’s former use. And inside, the colorful assortment of handpainted dishes from Turkey, handmade wooden tables from Texas artisans, Italian lamps, and contemporary light fixtures from around the world make me want to live in the store. 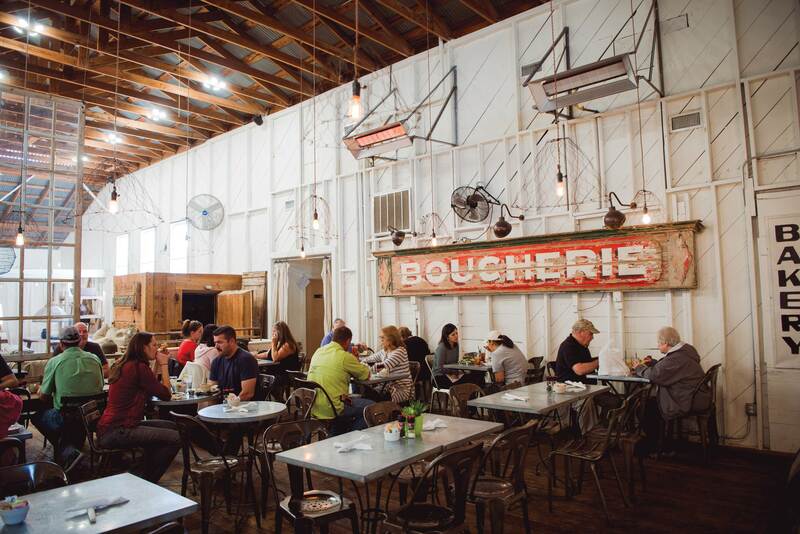 Across the street at Woerner Warehouse, there are light fixtures fashioned from old windmill blades, chandeliers crafted from old chicken feeders, battered lockers made into armoires, and lots of shabby-chic French bedding. (A café here serves a satisfying Tuscan cobb salad, among other light dishes.) 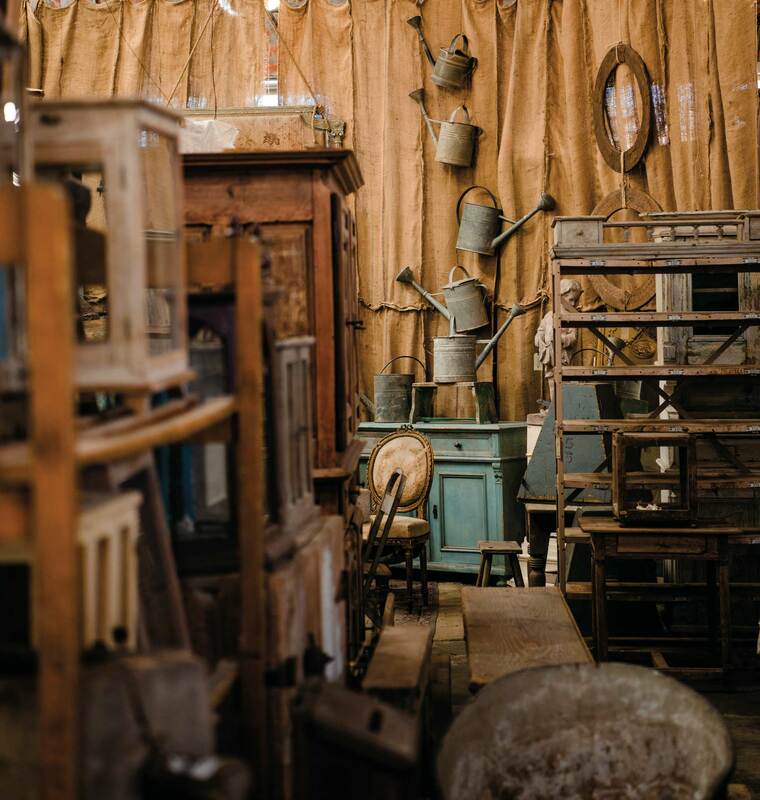 Next door, Carol Hicks Bolton Antiqüités brims with distressed doors, cabinets, wrought-iron patio tables, and washtubs, along with books, beds, fabrics, and old milk bottles—almost all of the inventory French. After such indulgences, my body and soul beg for downtime. That’s an easy fix at Nature’s Spa, among many reasons to visit Fredericksburg Herb Farm. In the couples’ massage room, my husband and I enjoy treatments incorporating herb-infused essential oils made on-site. Afterward, we sip herbal tea in a relaxation room and summon the will to return to our hideout on the western edge of town. There are more than 350 lodgings to choose from in the area, and whereas I once liked booking a B&B right in the center of town (there are at least 100 options in walking distance of downtown alone), I’m now happy to be removed from the hubbub. The perfect answer is Outlot 201, a small collection of guesthouses southwest of downtown. Our cottage is called Parker House, and its ample living-breakfast room is separated from the spacious bedroom and bathroom by a sliding barn door. The simple décor includes vintage egg crates on the wall and colorful throws for curling up on the sofa with a book. Massages and other treatments await at Nature’s Spa. Out the back door, there’s a brick patio facing a pasture where sheep, goats, and horses graze beyond the fence line. Bringing out a bottle from Kuhlman, we sip a glass, toasting Fredericksburg’s evolution and our good fortune to explore it. Fort Worth-based writer June Naylor enjoyed rediscovering Fredericksburg after so many years away. Photographer Tiffany Hofeldt of Austin specializes in portraits, culinary imagery, and nature.